The orchestra of Poland’s largest steelmaker is looking for majorettes. ArcelorMittal Steel’s orchestra is also recruiting musicians and working on refreshing its repertoire, said the orchestra’s director and conductor, Marek Seyfried. Because the orchestra was traditionally composed of retirees, he is focusing his recruitment efforts on younger musicians. 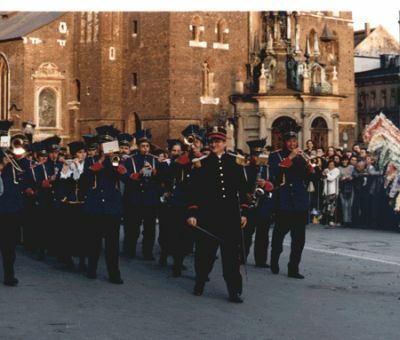 The orchestra will add majorettes to make its concerts “more attractive visually,” Seyfried told the daily newspaper Gazeta Wyborcza. They will do dance and cheerleading routines to the music. Seyfriend said he has no doubt they will become very popular. Mittal Steel of India bought out Arcelor S.A. a year ago. The orchestra that the company had sponsored had created goodwill for the company for 50 years. So Katowice-based Mittal Steel Poland decided not only to keep it, but make it better. Mittal, which changed its name on October 2 to ArcelorMittal Steel Poland to reflect a parent-company merger, decided that if the orchestra was “going to be our official visiting card, then it must be the best,” company spokesman Andrzej Krzysztalowski said. Seyfried decided to give the orchestra a new look that includes different uniforms and a different musical lineup. He also decided that it should take part in international musical festivals in addition to playing in Poland. “We are giving a free hand” to the director, Krzysztalowski said. Although the orchestra’s budget is a closely guarded secret, it is believed to cost several hundred thousand zloty a year. The orchestra’s new repertoire includes jazz and marches in addition to classical pieces. The 25 younger musicians who have joined it recently have lowered its average age considerably. The orchestra is seeking majorettes who have had experience strutting their stuff in parades and in front of bands. The idea of orchestra majorettes is “nothing new because majorettes accompany musicians worldwide,” Seyfried said. He said he is not talking about “cheerleaders with pompons.” The majorettes will need to be accomplished dancers, he said.”This is not a piece of cake,” he said. “In order to learn all the choreography, it is necessary to be smart and clever and have a very good memory and sense of rhythm.” Tryouts will be held to select the girls. A choreographer will teach the routines to those who are chosen. The majorettes’ uniforms have already been ordered. They will consist of the tops and skirts that are standard majorette flare.